“I never thought I’d see something like this, I love it! After a half-century run that has produced one of the greatest canons of song produced in the folk and country worlds, it is only fitting that tribute be paid to the talents of Ian Tyson. From his signature tunes in his early recording days of the sixties with his partner Sylvia (Fricker) Tyson, to creating a legacy in the world of cowboy culture for the past 25 years, this remarkable figure continues to exhibit staying power that few of his peers have enjoyed. From Someday Soon, Summer Wages and Four Strong Winds to gems like Old Corals and Sagebrush, MC Horses, Alberta’s Child, Will James, The Gift, La Primera and Old Cheyenne, these songs reflect the codes of the characters that played major roles in the west. In short, Tyson’s work is truly awe-inspiring. Fifteen years ago music journalist/broadcaster promoter Peter North and keyboardist singer-songwriter Stewart MacDougall (who has carved out an impressive career himself collaborating with k. d. lang and Tyson) decided it was time to pay homage to the man who has lived in the foothills of southern Alberta for almost 40 years. “I never thought I’d see something like this, I love it. Everyone does a great job and it’s wonderful to hear some of these artists put their own spins on songs, some that I had almost forgotten about,” Tyson has said to many broadcasters and journalists including Sheilagh Rogers of the CBC. Since that time, The Gift, with a core band of Tyson sidemen and rotating cast that features various members of the Alberta roots music community and some very special guest, has played corporate shows, festivals, concerts and agricultural fairs for folk, roots, and country fans who have raved about the show. “It’s hard to go wrong with this body of work and the musicians bring something unique to the show,” says producer Peter North who singles out MacDougall’s work on songs like La Primera, Elko Blues and You’re Not Alone Anymore as some of the highlights of The Gift. “Stewart’s years of playing in Ian’s band in the nineties is such an important component. He’s lived and breathed this music and Ian recorded Stewart’s Wind In The Wire on “I Outgrew The Wagon” and the two continued to write together, yielding- “Yellowhead to Yellowstone, the title tune of Ian’s 2009 album,” adds North. 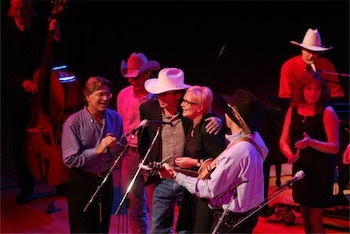 The Gift- A Tribute To Ian Tyson gave birth to a spin-off project, a fifteen song recording featuring seven of the performers who have participated in the live concerts and a handful of Tyson associates and peers that was released on Stony Plain Records to similarly great reviews and no wonder given the cast includes Jennifer Warnes, Amos Garrett, Blue Rodeo, Ramblin' Jack Elliott, Corb Lund and members of the The Gift live show. It has become "The Gift that keeps on giving for fans of the great body of work that Ian Tyson has given us over the years," adds North. and a long overdue tribute to a living legend”. some of which I'd forgotten I'd written and recorded". to all of Tyson’s fans and enthusiasts of country folk music”.